1. Is there a minimum length of stay in your Paris apartment rentals? 3. Is it possible to arrive at our flat on any week day? 4. Do I need to pack my own travel iron or hairdryer? 5. Will I need to bring anything for cooking at “home” in my rental? 6. At what time is the check-in? 7. Are the apartments air-conditioned? 8. When will the security deposit be returned? 9. How about DSL/Wifi,Telephone and Computer? 10. In which currency are your rates? 11. What are your agency cancellation terms? 12. Can you provide crib, stroller or high chair for guests traveling with young children? 13. Are the pictures and views on your site accurate representations of what we will be renting? 14. Is it possible to smoke in the apartments? 15. What is the process to book one of your Paris rental apartments? 16. Are the apartments serviced? 17. Are your rental apartments located in safe neighborhoods? 18. What payment methods do you accept? 19. If we choose a Paris apartment rental from you, how do we know you’re legit? 20. Is there anything we need to bring, are your apartments fully equipped? 21. When should we book our Paris apartment rental? 22. Is bringing a small pet allowed? 23. Can you recommend good restaurants in the neighborhood? 24. Are all your apartments centrally located and accessible via public transportation? 25. Can you help us to set up an excursion a little farther afoot? 26. Is there Chauffeur Service provided? All Paris For Rent rental prices are in US Dollars and include everything except a final cleaning fee and the City Occupancy Tax. The amount for the final cleaning fee varies depending on the number of bedrooms and size of apartments, from $150 to $450. Currently, the Paris Occupancy Tax is $1 per adult and per night. The price you are quoted for your stay is the price you will pay. There are no surprise fees, taxes or surcharges. Yes, rentals can begin and end on the day you choose. We feel this allows greater flexibility in booking air travel and allows you to find the best fares. Extra arrival coordination charges may apply if occupancy commences on a Sunday, on Christmas Day, Bastille Day or on New Years' Day. All of our properties are provided with ironing board, iron and hairdryer. If you need to bring small additional appliances (such as electric razors,curling irons) you will need to bring AC adaptors for the European 220 volt current. Only the food! All our kitchens are fully outfitted with everything you would need to make a meal at home. All the basic equipment is provided, and in most cases, the appliances are high-end, and the cookware gourmet quality. Unless other arrangements have been made in advance with FFR, occupancy commences at 4:00 PM on the Arrival Date and terminates at 10.00 AM on the Departure Date. Morning check-ins from 9:00 AM can be arranged only if the previous renter has vacated the Premises the day before. Early check-ins from 7:00 AM to 9:00 AM and Evening check-ins from 7:00 PM to 10:00 PM are subject to a US$75 fee charged to the credit card on file. We do have several air-conditioned apartments, a rare feature in Paris where most apartments and many hotels are not. We are happy to direct you to our air-conditioned rentals if you prefer so. All our other properties are equipped with fans for your convenience. The security deposit is cashed upon submission, and is returned seven business days after the last day of occupancy to the address we have on file. 9. How about Wifi, Telephone and Computer? All of our apartments have a telephone. In most of them calls are free to the US, Canada, England, Australia and several other countries. Local calls are free (except to cell phones in France). All of our apartments have complimentary Wifi; some rare apartments also provide computers. Our rates are expressed in US$ and are fully inclusive. Payments are PARTLY REFUNDABLE in accordance with the rental agreement (read it here). If renting any of our properties, you agree to respect the terms and conditions of our agreement. We strongly recommend that you purchase a Travel Insurance should you unexpectedly have to cancel. We are happy to recommend several reputable companies should you wish to protect your travel investment in this way. Absolutely, we can provide anything you might need to make your youngest guests comfortable for a small fee. Please be sure to ask. Yes. We are consistently maintaining and improving our apartments during the quiet months and we update our pictures regularly. They are provided in good faith and in the belief that they are accurate and based on the latest information we received. However, Paris For Rent declines all responsibility for any modifications made by the owners without our knowledge. Sorry, all our properties are strictly non-smoking. First, call or email us to confirm availability when you are ready to book. Our representatives will gladly offer you advices according to your preferences. We will follow-up with detailed instructions on the next steps. We ask for a 50% payment at the booking, with the remainder plus refundable security deposit 45 days before arrival. If you are booking within 45 days, we will ask for full payment up front. Upon receipt of the deposit we will send all the necessary information: apartment instructions, greeter information and rent receipt. 17. Are the apartments serviced? They are not normally serviced and you are expected to self-cater. 19. Are your rental apartments located in safe neighborhoods? Our apartments are only located in the safest Paris neighborhoods. (Paris is overall a very safe City). We want you to feel comfortable taking walking on your own. Having said that, we do recommend that you apply the basic rules of safety that you would observe in any foreign city. 21. What payment methods do you accept? You can pay for your rental by Visa/Amex/Mastercard online using our secure server. You may also pay by bank wire transfer or personal check (from a US bank). We will send you full instructions on how to pay when you book. All rentals require a separate payment of a security deposit for potential damages - The security deposit is refunded in full 7 business days after check out. Payment of the security deposit must be made by check from a US bank or by wire transfer in either USD or Euros. 22. If we choose a Paris apartment rental from you, how do we know you’re legit? 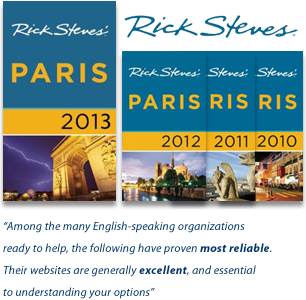 After more than 19 years in the business of Paris vacation apartment rentals, we have been recommended by several leading publications including Rick Steves’ Paris (Every year since 2010), Forbes, American Airlines Magazine, the Washington Post and the Great Sleeps in Paris guide book. Our agency has been also rated “Excellent” by Trip Advisor and awarded “Winner 2014” of the Top Rental Manager 2014. Travelers rated us one of Flipkey's best. We are also happy to refer you to numerous previous guests in the United States, Australia, Brazil, Canada and many other countries that who would be happy to tell you about their experiences with us. We also publish our customer feedback on each apartment page and invite you to send yours after your stay! We are very proud of having many returning customers and it is our sincere hope that each new rental is not a one-time deal but the beginning of a relationship that will continue. 23. Is there anything we need to bring, are your apartments fully equipped? We want you to feel at home the moment you arrive. We provide everything from towels, bed linens, dishes, cookware, appliances, irons and ironing boards to hair dryers. We try to describe each apartment in detail on our website but feel free to ask our representative for more details on any given property. 24. When should we book our Paris apartment rental? Some of our apartments are booked up to six months in advance, often by returning guests. It is safer that you contact us for availability as soon as you know your travel dates. 25. Is bringing a small pet allowed? Many guests have allergies and we try to provide an antigen-free environment, therefore we do not allow pets. 26. Can you recommend good restaurants in the neighborhood? Your Paris For Rent representative can provide you with recommendations. They can also book restaurants for you as well as many other activities. Upon arrival, a knowledgeable and English speaking member of our staff, will also be happy to direct you to the best neighborhood eateries, as well as bakeries, markets, and anything else that may be of interest to you during you stay. 27. Are all your apartments centrally located and accessible via public transportation? Yes. All Paris For Rent apartments are located in the heart of Paris and thus very close to many tourist attractions and business centers. Each apartment is no more than a 5 minute walk to a Paris subway station, RER, or a bus stop. Being in the center of Paris means that your apartment will be within walking distance to many of the major monuments or a short bus ride away or subway. 28. Can you help us to set up an excursion a little farther afoot? Your Paris For Rent representative can provide you with a list of excursions and rates upon request. They can also tailor a tour for you as well as many other activities. 29. Is there Chauffeur Service provided? We will be happy to organize a Chauffeur service for you. The private company we work with charges 90 € for up to three guests and 110 € for 4–9 guests, which is payable directly to the driver. The driver will wait for you after customs with a sign. He will also call our greeter from the car and help with the greeting coordination. This is a highly recommended service to make your arrival and departure as easy as possible. If your questions haven't been answered above, please contact us by email or call at +1 415 642 1111. We strongly recommend that you call one of our representatives rather than e-mail. They are the best source of information and can bring up important issues that you may not have thought about for your trip. Founded in 1998, we have been hosting thousands of guests in our apartments in Paris for more than a decade, nearly 30% of them loyally returning year after year. Located in Austin, Texas, Paris For Rent is a US-based agency with partner service staff in Paris. Paris For Rent is based in Austin, Texas with teams throughout the US & partners in Paris.